Earlier this year, after the removal of the big leaf maple, we planted an edible landscape garden, which is a mix of ornamentals and edibles heavily mulched by the big leaf maple wood chips. Some of my edibles are loving this environment. The sugar pumpkin vine above is absolutely huge! It spans way beyond the edges of the photo and has at least five fairly large pumpkins growing. This is one of two pumpkins that are nearly ready. 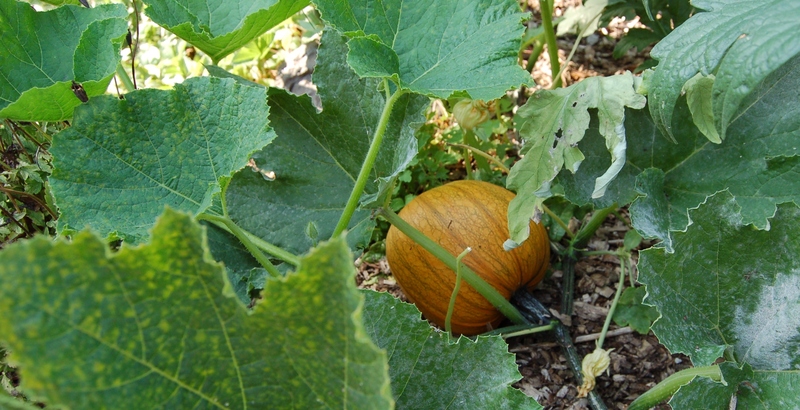 The vine is developing some powder mildew problems, so I hope the pumpkins all ripen before the vine dies out. Also happy in the heavily mulched edible landscape are the Japanese cucumbers. These cukes are super long and have a lovely taste. 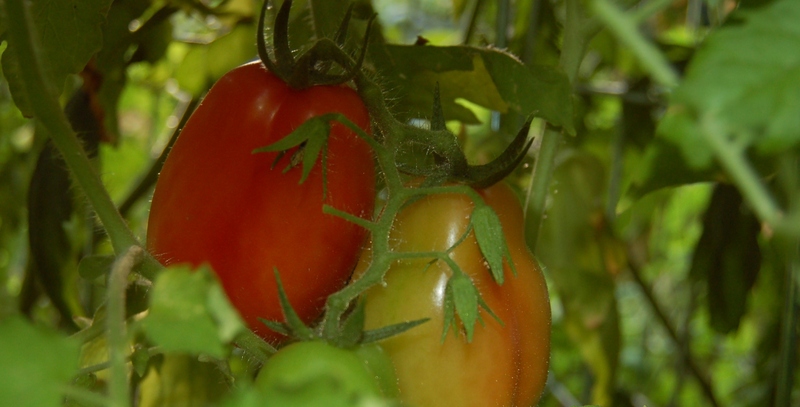 In the greenhouse, the San Marzano tomatoes are ripening. The Sungold cherry tomatoes have been ripe for weeks, but I’m just now getting ripe tomatoes of the larger varieties. I imagine I’ll be making and canning some sauce in a few weeks! This entry was posted in Gardening and tagged cucumbers, edible landscaping, pumpkins, tomatoes. Bookmark the permalink. Your new planting area is doing marvelously! The pumpkins are definitely far enough along that they will finish out even if the mildew takes the plants down tomorrow. I have had an issue with the tomatoes not setting fruit very well this year. They have flowered profusely but we had too cool for too long during the prime fruit setting period and they dropped blossoms rather than form fruit. There is alot from the earlier warm period and more setting right now – but this big gap in what should have been the prime production period. Plants are healthy though, just a temperature issue.